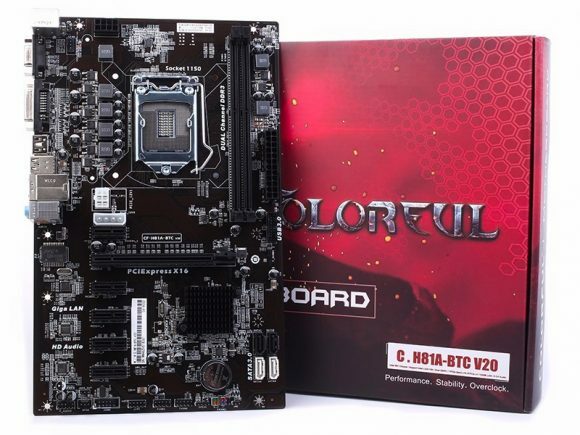 The first motherboard Colorful C.H81A-BTC V20 is essentially not entirely new, it was announced a while ago and should already be on the market, while the other two new models will most likely be available later this month. The C.H81A-BTC V20 is based on Intel H81 chipset and is intended for Intel LGA1150 processors, providing support for up to 6x GPUs. A pretty basic alternative to other popular solutions like AsRock’s H81 Pro BTC for example that this product from Colorful kind of seems to be designed from. For more information visit the official English product page of the C.H81A-BTC V20. The next model which is more up to date in the form of chipset and features is the Colorful C.B250A-BTC V20. It is an Intel B250 based motherboard intended for the more recent Intel LGA 1151 processors with support for up to 12 video cards, though that 12 GPU support may be limited depending on the operating system you use (up to 8 AMD/Nvidia under Windows). What is more interesting here is that the motherboard actually has just 6x PCI-E slots and the other 6x GPUs connect via USB 3.0 connectors. This simply means that you do not need to use the small PCB board that plugs in the PCI-E slots from the usual package of PCI-E riser boards that rely on USB 3.0 cables for data. For more information visit the official English product page of the C.B250A-BTC V20. The third offer is with a non-standard motherboard in terms of size and features as it is probably originally intended to be used in dedicated GPU miners like the ones with 8x GP106 mining edition cards from Nvidia. The Colorful C.B250A-BTC PLUS V20 is based on Intel B250 chipset and is intended for 8x GPUs without the need of any PCI-E risers as the board comes with full size x16 PCI-E slots with enough space in between them. 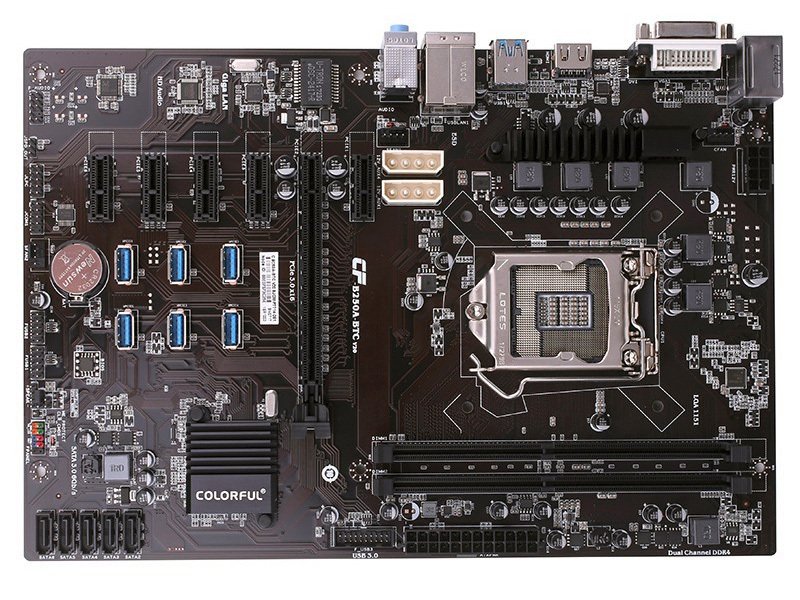 The presence of two rows of 8x PCI-E power connectors suggests that the motherboard is designed to handle higher power loads, there are some more specifics about this product as well like the use of SO-DIMM memory slot. 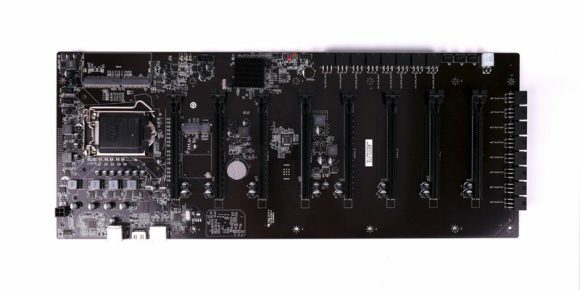 The connectivity of the backplane is more limited in terms of connectivity and there is no traditional 20/24-pin ATX motherboard power connector apparently being used here. For more information visit the official English product page of the C.B250A-BTC PLUS V20.